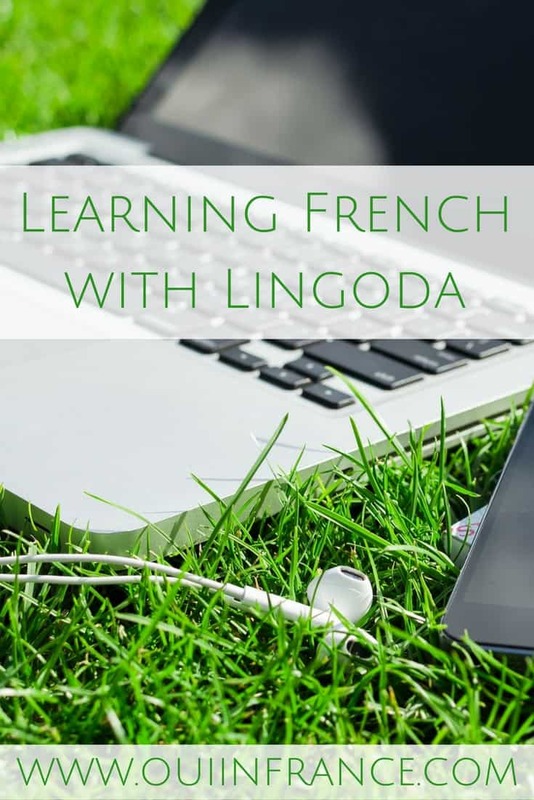 Lingoda review: How to learn French online the right way & FAST! Read on for my Lingoda review! 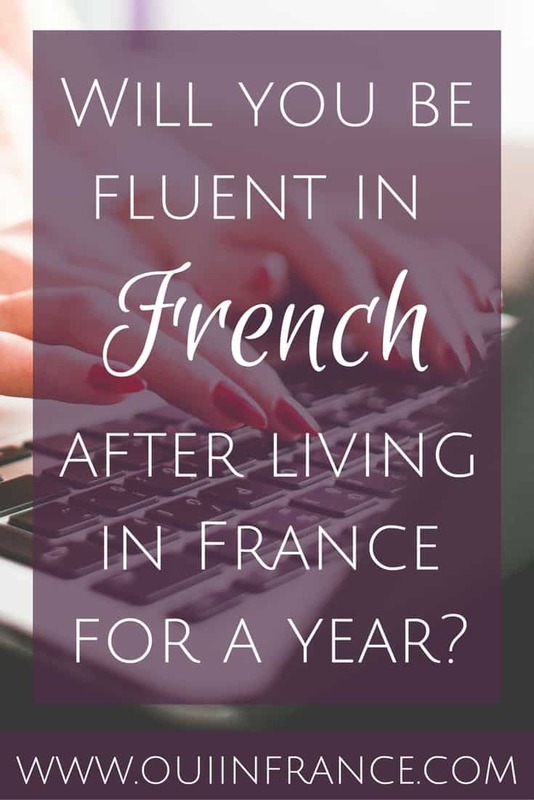 Contrary to what many people might think, simply living in France will not magically make you fluent in French in a matter of months. Living here will help you up until a certain point, but to really improve your level, you’ll need to study French beyond what interactions at the pharmacy and grocery store (or small talk) can provide. Having a background in French from high school or college helps, too. 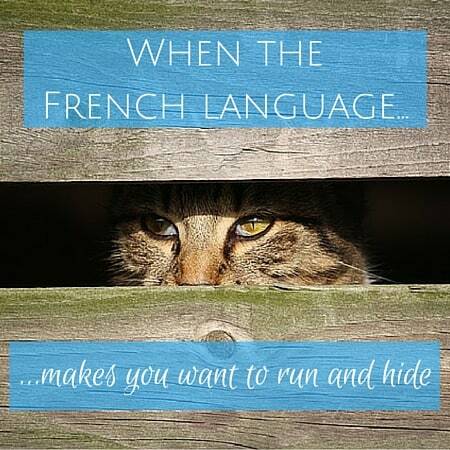 But what do you do when you aren’t sure about how to take your French to the next level? Private lessons can be expensive, we don’t all have access to native speakers, and books can be ineffective and boring. How can a language learner boost their foreign language skills no matter where they are in the world? With Lingoda. Here’s my Lingoda review. Anyone who’s ever seriously attempted to learn a foreign language has struggled at some point. Maybe it’s with the language itself or just trying to find the time and motivation to progress. Do any of the above problems resonate with you? I’ve experienced them all at one point or another. Now I have native speakers all around me, but is that alone enough to get better? Nope. Learning a foreign language is no easy feat and is an ongoing process. There’s no end date and there’s always more to learn. Learning the basics and then getting to an intermediate level is pretty straightforward, but going from intermediate to advanced or advanced to fluent is a longggg journey. You might even plateau for years because you’re “good enough.” You speak just fine and can hold your own just about anywhere, but you still make mistakes. 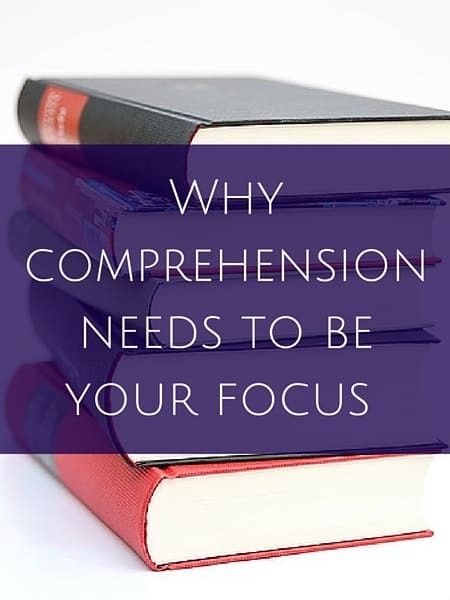 You’re at a point where you know there’s a lot of vocab and grammar nuances that you haven’t mastered but these things don’t impact your ability to work, converse, and be understood. That’s where I am right now. It’s nearly impossible to speak, write, read, and understand a foreign language well if you don’t take time to learn the basics and then make it a point to keep on learning as your level improves. Yes, immersing yourself in the language will improve your comprehension and overall level, and reading grammar books will improve your grammar, but without structured lessons of some sort with real-time feedback, it’s difficult to move forward in a language once you’ve reached a plateau. My goal is to speak French like Tom, my French native husband, just with my accent and flair but no mistakes. So continuing on a personal note, I speak French but my writing abilities aren’t at the same level. Why? Because I don’t practice writing enough. I speak just fine but once you reach a certain level, people don’t feel the need to correct you if you’re “good enough” and you go on making the same mistakes without even knowing. You may even find yourself having the same types of conversations with people over and over, never really going beyond a certain conversational level of speech. The place I speak with French people the most beyond simple chit chat (like at the pharmacist or cashier at the grocery store) is at the gym. But I speak with the same people about the same topics day in and day out. In my opinion, to improve your level in a foreign language, you have to consciously work at it from a variety of angles. So not just reading, or studying grammar, or conversation practice. All the pieces of the puzzle have to work in harmony to make progress. To that end, let me introduce you to one of the best tools out there. Here’s my Lingoda review. Lingoda is a language learning company based in Germany that offers lessons in German, French, Spanish, and English. 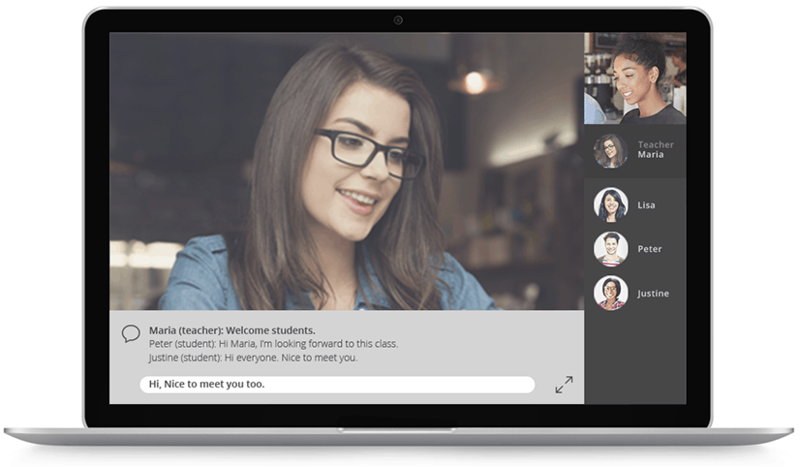 They operate online and offer private and group classes with native speakers. Their framework is engaging, comprehensive and extremely well done. I do not say that lightly. I get emails weekly from companies looking for my help in promoting their products and services, and 99% of the time I politely decline. Lingoda is worth your time and money if you’re serious about learning a language. To get a feel for the service, their manager reached out and offered me a few trial classes to test out the service. I haven’t taken a French class in years and I was nervous because there’s a lot I don’t know. Speaking/comprehension are strongest and my French writing and grammar need work. I know I don’t work hard enough to improve my level of French. But luckily, I survived and actually loved it! All classes are taught online in real time and you don’t need any fancy software to get started. Some teachers will just use audio, but it’s more fun when everyone has their webcam turned on so you can see each other. Each class is one hour and focuses on a particular topic or concept. There’s a thorough PDF that goes with each class — about 25 pages long — that acts as a guide for each lesson. When you first sign up, you’ll be assigned a personal advisor who will assess your level, go over the Lingoda dashboard, get you set up from a technical standpoint, and answer any questions you might have. You can start from zero knowledge of French beyond bonjour (or the language you choose) all the way up to a C2 (master) level. You can choose from a very diverse selection of classes that are categorized by their subject and focus. 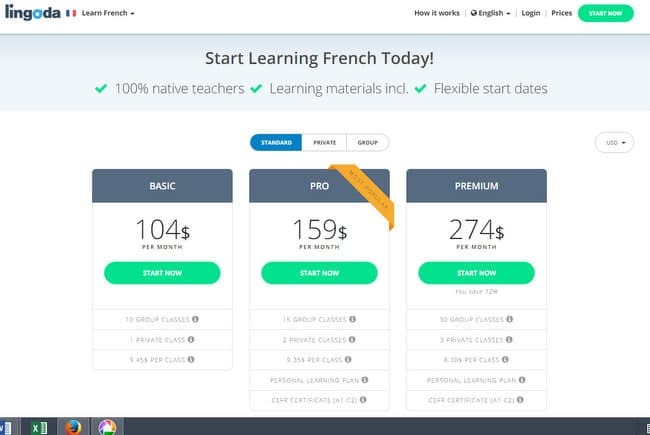 The screenshot below shows a small sampling of French class options at the C2 level. It’s so important to be interested in what you’re learning and Lingoda makes it easy. For example, if you’re a bit of a foodie, you can take a bunch of lessons with content centered around food and gastronomy. So you’ll be learning the particular grammar point within the context of food. Topics are vast and range from globalization to education to happiness and more, just to give you a few examples. The breadth of subject matter covered is probably the most impressive thing about Lingoda. Also, you’re not required to go in order by any means. If your subjunctive needs work, then book that class. If you want to focus on adjective use, book that one. 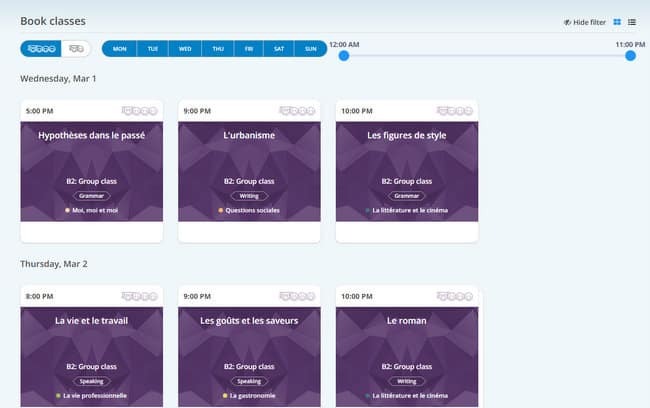 Lingoda lets you decide what classes to take so you get the most out of the service. 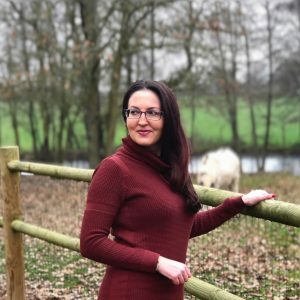 You can also pick from classes focusing on speaking, writing or grammar, depending on what you feel like and what you need to practice the most. You can choose an instructor as well so classes won’t necessarily be with the same person, unless you want to stick with a particular instructor. This adds variety to the mix and exposes the student to different styles of speech and teaching, something you wouldn’t get if you work with only one instructor in a traditional setting. The class schedules were also impressive with at least 3 group classes per day, sometimes starting at 5am with options until 11pm! No matter your schedule, you’ll find a class that works for you. If there isn’t a time that works for you, you can set up a private class instead. 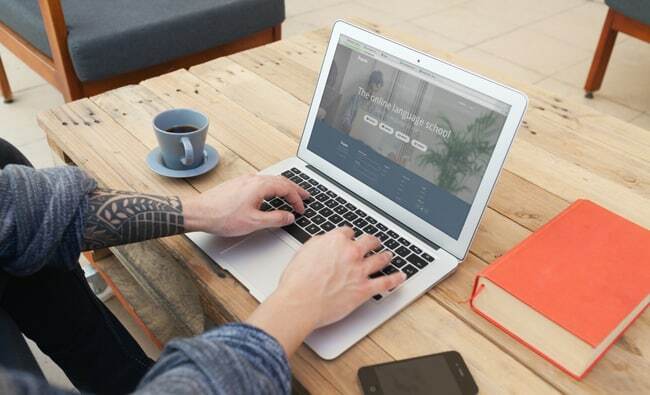 Lingoda operates as a monthly subscription service. Depending on the tier you choose, you get a certain number of private and/or group classes that you can then book based on your availability, level, and interests. The lowest-priced option includes 10 group classes for US$79/month. Classes are small with an average class size of 5 students. In the group classes I took, there were just 2 of us. You aren’t obligated for any length of time, so if you’re only looking to take classes for a few months while you live abroad or to prepare for a trip or to just brush up on speaking skills, you’re not locked in to the service for a year or anything like that. Another thing about the cost. At first glance, you might think, “Ohh, that’s expensive.” But around here, private lessons cost upwards of 20 euros/hour. At that price, how many can you really afford per month? If you break it down, Lingoda is very reasonably priced, in my opinion. I’m the type of person who likes to get her money’s worth. If I know I’m paying a certain amount for a service, I’m going to make sure I take full advantage and take all the classes allotted to me. If you need some motivation to learn, seeing that charge on your bank statement every month might be just the incentive you need. Yup! Click my link here to take a 60-minute 1-on-1 trial class for only 99 cents before you sign up for anything beyond that. Just click “Start now” at the top of the page once you click over to redeem that offer. There’s also a 7-day money-back guarantee in case you change your mind, so there’s no harm in trying out Lingoda to see if it’s for you. Impressed with lessons. Their variety and comprehensive nature were definite pluses. 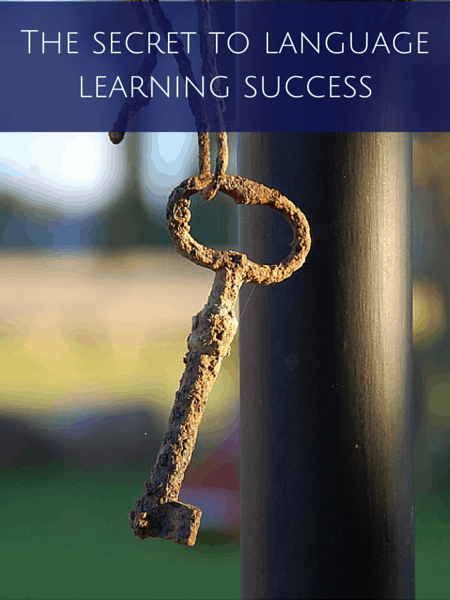 The 25-page PDFs were professionally done, thorough, and full of relevant exercises. You can choose the classes you want to take. The trajectory you take is your choice, so if a particular lesson doesn’t interest you, skip it. If your speaking level is more of a B1 level, you can take classes focused on speaking at that level and then head back to A2 for grammar. Or whatever level suits your particular needs. Class sizes are small. As I said, there were only 2 of us plus the instructor in the group classes I took. offering a pay per class option instead of a monthly service. I personally like the subscription model because paying for something will force me to show up for class and get my money’s worth. But others have different goals and maybe they just want to be able to take classes here and there and not have a certain number of classes per month and a recurring charge. having a 24-hr support phone line or chat in multiple languages. Customers are all over the globe and if tech problems arise, it’s nice to know someone is there for you no matter what time of day it is. less structured classes or more time for improvisation based on looser guidelines. I found the classes to be well planned but they followed the PDF very closely. I’d like an option to take a less structured class as well. Lingoda is a phenomenal language learning company that I wholeheartedly recommend. After trying the service, I feel motivated to continue learning (something I desperately need) and was surprised how much I learned in a short period of time. What tools and services work best for you when it comes to learning a language? Would you consider learning French with Lingoda? Disclosure: Please note I’m an affiliate of Lingoda and may earn a commission if you sign up for classes. Thank you for supporting Oui In France. Interesting! I know I need to kick it up, to really nail conjugations of some irregular verbs, get the subjunctive and anterieur tenses down. Thanks for this suggestion. That looks a very interesting learning approach, modern and tuned in to current day behavior and interests. At that price you need be able to afford it or really want a certain quality. You get what you pay for in life (most of the time) and it’s interesting to see you recommend it so highly. Your certainly well placed to do so. 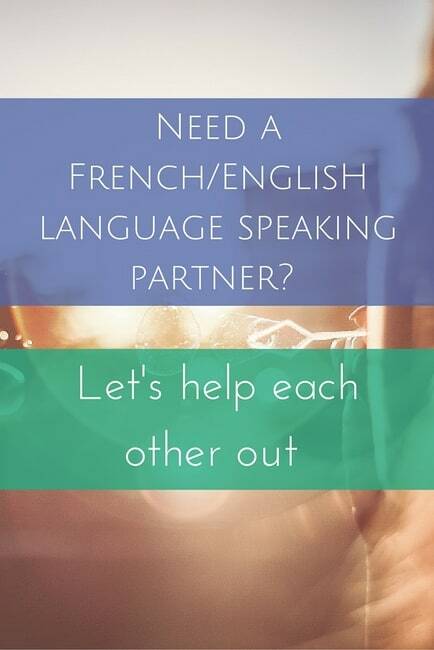 I may give it a try sometime, as you say, it is always beneficial to give language skills a boost every now and again, it doesn’t matter how good you are. If your not using it, it’s so easy to forget and it’s not a bad thing to iron out those accumulated bad habits too. A class like discipline gets most of us to focus properly on the task. Over the years I’ve been back to night school, taken a private tutor, done some internet classes, it all helps. Perfection is a tough call, though striving to be pretty good is worthwhilel. Time is on your side Diane. Be interesting to see what you think about Lingoda in a couple of years time. I hadn’t heard of Lingoda. I have some of those problems you listed, the main one being no native speaker to practice with. I have been taking private lessons for three years on and off. It is expensive but I know I would lack the motivation and discipline required to learn at home from books and the internet. I too really need to up my game with conjugation and remembering when to use the subjunctive. I’m not too bad when writing but when speaking, I forget it all! Btw, when at home do you and Tom converse mainly in French? To answer your question, surprisingly enough (or maybe not), we speak mostly English when it’s just the two of us. That’s because when we first met, Tom’s English was better than my French and it’s a habit we adopted early on. We just got used to speaking English to each other. We’ve tried a few times to have French days or French afternoons but seems after 20 minutes or so, someone reverts back to English (usually him!). Habits are hard to change! It’s funny because I don’t think of Tom as my husband, the French guy. I think of him as my husband, the guy who speaks English with an accent. Our relationship developed in both languages but English has always been the default I think. Thanks for the heads-up; I’ll give Lingoda a look. I agree with you that once you get to a certain level it’s easy to say “that’s good enough” and stop studying, even though you should. You won’t get better without that. I also agree that you need a mix of things to improve and especially to stay motivated – structured study, conversation, reading, etc. I get a lot out of Le Monde, especially when I read about subjects that are also being covered in the US press – that gives me a leg up on comprehension because I already know the basics of the story. I signed up for classes! This works really well for me because I travel for work and can’t commit to a classroom. I’ve taken two classes and really enjoy it. Even the format/online ‘classroom’ doesn’t bother me. I found it works well. I should be in better shape for my trip to France in October!! Thanks for the recommendation!!! So happy to hear it, Michelle. The format is really great for people who travel and/or can’t commit to a standing appointment. Enjoy! Thank you for a great and thorough review! It helped me improve my French but also German skills.